Yext has over 100 services built from a Java codebase spanning over 3600 source files. How do we avoid tearing our hair out at inter-service dependency management or ending up with giant binaries that take forever to build and deploy? We use ICBM: Ilia's Crazy Build Machine. Yext built ICBM so that we could spend less time fighting our build system and more time coding. We're open sourcing it this September to help others with large Java code bases. 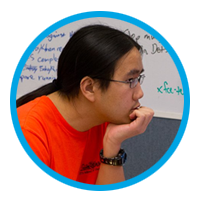 Austin Chu is a software engineer at Yext and the current maintainer of ICBM. Beyond ICBM, Austin has contributed to all levels of the Yext stack, including building Yext's custom deployment infrastructure. He founded the ARG at Yext (Architecture Reading Group), a reading group for engineers interested in software and systems architecture. Before joining Yext in 2010, Austin graduated with a bachelor's in computer engineering from MIT. Yext (www.yext.com) builds technology to maintain perfectly accurate location information across the web. Until Yext came along, it was nearly impossible to correct, update, and maintain information about business locations across dozens of platforms simultaneously. So when opening hours of your local supermarket are up to date on Thanksgiving you know who to thank. You can read about the Yext team and culture on The Muse, and our latest product launch on Venture Beat.